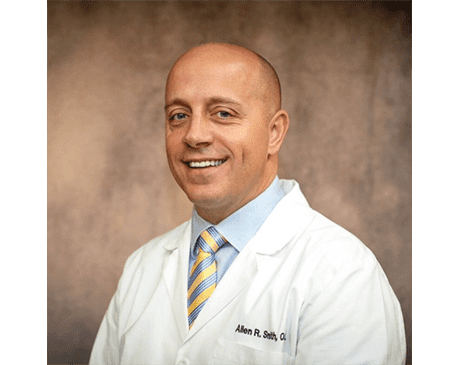 Allen R. Smith, OD, is an optometrist who has been on the team at Lifetime Eyecare in Jenison, Michigan, since 2005. He has a passion for his work and a love for his patients that is hard to match. In addition to being a member of the American Optometric Association, Dr. Smith is a former President of the West Michigan Optometric Association and a former Board Trustee of the Michigan Optometric Association. He is still an active member of both organizations. Dr. Smith is also a U.S. Navy veteran. After receiving his bachelor degree in visual science from Ferris State University in Big Rapids, Michigan, and earning his doctorate in optometry from the Michigan College of Optometry, he joined the Navy and quickly received recognition for his clinical skills and patient care. For this, he was awarded the Navy’s prestigious Commendation Medal before being honorably discharged. At Lifetime Eyecare, Dr. Smith is committed to maintaining the optical health of patients of all ages and takes special care to get children started early with monitoring their vision health. He’s an active participant in the InfantSee program offering children free eye exams during their first year of life. For all patients, he specializes in dry eye therapies, including LipiFlow®, glaucoma treatments, and bifocal contact lens fittings.